These are strange days. We put up a picture of these Le Coq Sportifs on our Instagram and somebody commented that they were “ugly.” Then we looked at their feed and there was a shot of them gloating with some Barkley Posites, followed by a load of #hashtags. Cue the ‘Different Strokes’ theme song. 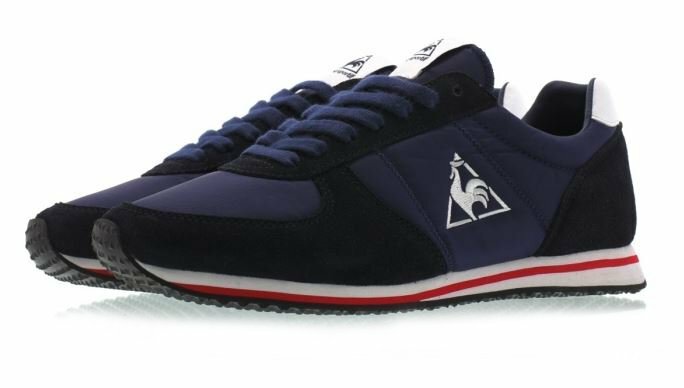 We like the Le Coq Sportif Eclat a great deal – we’ve seen people call them out for looking like adi ZX models for some baffling reason, despite the different shape and design. People are very odd.Le Coq Sportif probably could have knocked off the ZX series with immunity too, seeing as they were adidas affiliated when these dropped in 1985 (in fact, that relationship continued for another decade), but this is very much a Gallic kind of running shoe reinterpretation. It wouldn’t even bother running — it would just puff Gitanes and make disco sampling dance music before sauntering along and stealing your giro to make her its mistress. The Footpatrol edition of this model was a beauty and subsequent colourways have used the angular heel panel’s scope for colour. These versions shift from the mid 1980s to some 1989 colour inspiration (that might even be from the LCS olde world performance shoe vaults) and that Directoire Blue and Gecko Green edition looks a bit like a Masters of the Universe toy from when that franchise was fading, but that Alloy and Simply Purple makeup and the White and Atomic Blue? Those are an easy wear. We might have resigned speckled soles to the “played-out” pile a while ago, but it looks like people are loving some patterning on their shoe soles all over again and Le Coq Sportif’s take on it is far better than the rest, working the upper of each shoe’s key colours into the foam.